As a single girl, I look to Valentine's Day this year for a release of "cheesy" energy. Sometimes you just want to be a dork. So... what better way to celebrate than by getting all dressed up in the holiday's signature colors! Here you will find ways that Casey and I have incorporated the good ole red and pink into our routines! We have separated everything into one of two categories- subtle or extreme. If you want to go crazy and be a little more sassy this Valentine's Day, try our EXTREME looks. If you want to stay on the sweet side, stick with our SUBTLE looks. Both of the nails are super simple. DIY here. 1. Wet your hair where you want the color to be. 3. Let hair dry and run a brush through the hair to remove excess chalk. WARNING- Your hands will more than likely end up like this... But with some soap and water it washes right off. *We first saw this idea here. To make this outfit even more subtle, you could leave out the hat, we just really wanted to say "Valentine's Day" with these looks. Pairing a red skirt with a very pale pink top works so well, you could wear it on any day- you don't have to save it for February 14th. Adding neutral accessories and shoes tones down the look just enough. 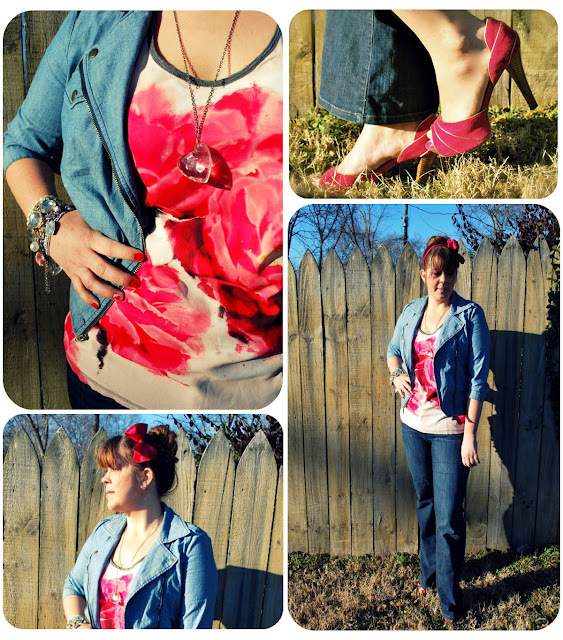 What better way to dress for the occasion than with a rose print shirt? The mixed denim keep this look simple. Casey played this look up with piled on bracelets and a sweet red headband. So maybe I'm taking the pink and red thing a little too far but I just can't resist... I like the clash that comes from a bright orange-y red and hot bubble gum-ish pink. I added in a plain red to provide a buffer and the black blazer cools it off, barely. Dress- F21, Blazer- F21, Tights- Target, Locket Necklace- F21, Scarf- F21... seems there is a trend in this outfit... Shoes- Nine West, Hoop earrings- I can't remember but let's just say F21, it's very likely. Seems Casey likes the red and pink clash too. 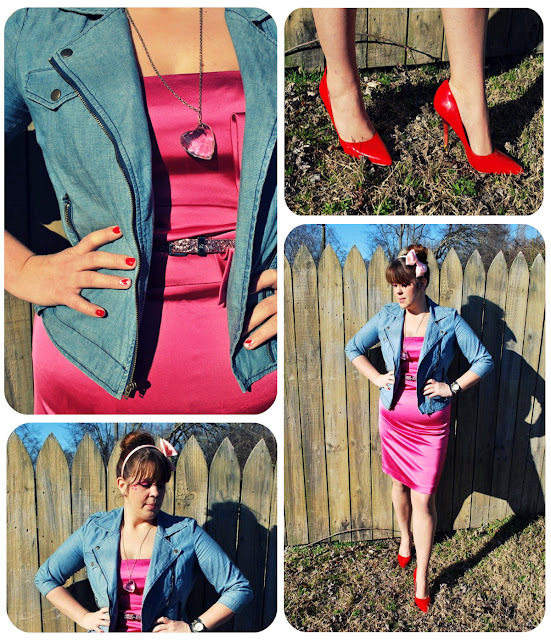 This look shows us just how versatile this denim jacket is. The glitter belt and the heart necklace add a special sparkly touch. Well that is all the Valentine's Love we have for today! 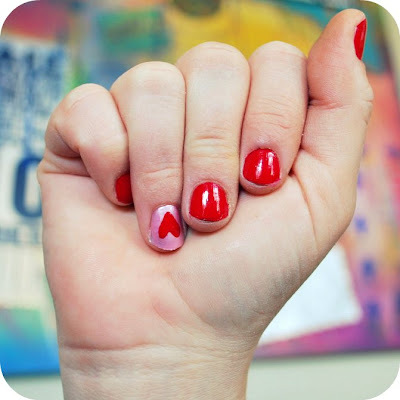 Add your links in the comments section so we can check out what everyone else is doing in honor of Valentine's Day! And if you aren't already following us, please do! Does the color-tipped hair idea work with darker locks? Yes! The soft pastels/chalk pastels work on dark hair! Just make sure you wet your hair first and try not to brush through your hair until you are ready to take the color off! Definitely try it! I'll do this year round just for fun! you don't know how much this feeds my obsession of turning my hair purty colors! it's an issue. soft pastels....like, craypas? NO, not like craypas. Those are oil-based (I'm pretty sure). You want the chalk-like pastels. They shouldn't be greasy-like. Does that make sense? I love the soft pastel hair thing. I have soft pastels already, but they're hard to draw with, and it'll be awesome to streak my hair with them! I'm thinking orange, my hair is black and really long. Thanks so much, and your post is awesome. when you say style your hair in a way it wont move does that mean after its chalked while its drying? or do you mean that once its all done you cant wear your hair down or the color will get on your shirt? i love this idea and i want to see more of it so i look at the links to where you saw the inspiration but it is such a shame you link to main page of the website and not directly to a post text say "
So sidewalk chalk and oil pastels wont work? Why won't oil based chalks work? And anything else I use do for the hair colorings? I love the hair dying. how easy will it come out of your hair? what kind of pastel did you use? Hey, what colour would you recommend for dark brown hair for the temporary hair colour?